She has sprouting from all over ! Soobin Yoon, Daejeon phillharmonic orchestra principal flutist. Lovely curious musician. With her, you should always expect the unexpected! 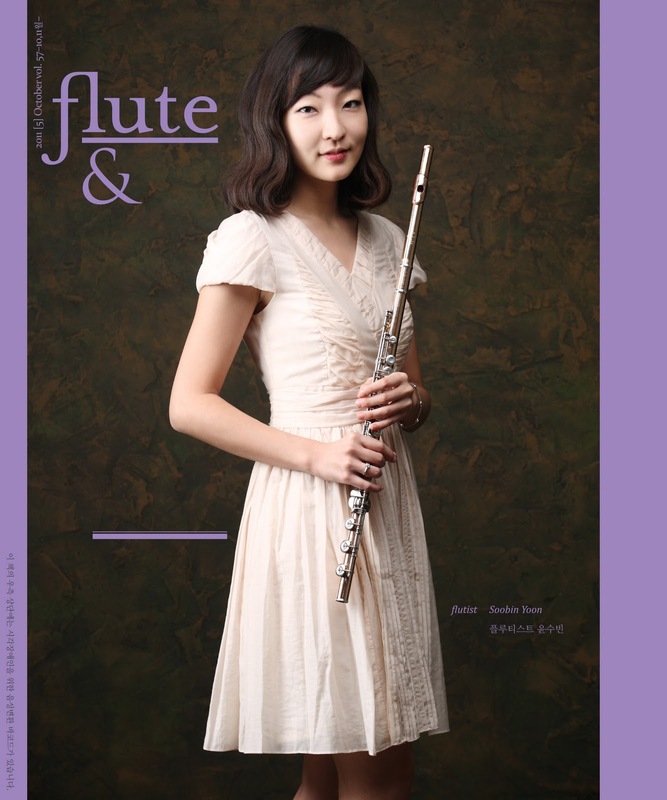 Flutist Soobin Yoon has been performing in numerous recitals, debut concerts, chamber music concerts, new music ensemble concerts and concerts in international festivals in Korea, Russia and U.S.A.
After her graduation at Sunhwa art junior-high school and Seoul Arts High School, She attended to Seoul National University and graduated first. During this period, she won many main competitions in Korea include Busan Music competition, Korea Flute association competiion, Eumakchunchu magazine competition, Korean chamber competition, Cheion music competition and Sookmyung Univ. competition. She studied with Rocksun Moon, Soyoung Lee and Youngji Song in Korea. She got her master of music degree in Cleveland Institute of Music studied with Joshua Smith, principal flutist in Cleveland Orchestra. She also won the prize at the chamber music competition in Texas festival. 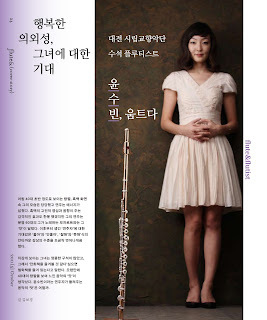 She currently plays as principal flutist in the Daejeon Philharmonic Orchestra and teaches at Choongnam University. 짹짹짹 “어렸을 적 새소리를 좋아했어요. 새소리 테이프가 집에 있어서 듣고 또 듣고... 소리를 들으면 무슨 새인지 알아 맞출 정도였죠. 그래서 윤무부 교수님처럼 조류학자가 돼야겠다고 꿈꾸기도 했어요.” 플루트도 새소리와 비슷해서 호감이 갔다. 초등학교에 들어가 특별활동으로 플루트를 선택하는 것은 당연한 일이었다. 5학년 처음 손에 든 플루트는 그녀의 재능을 알아본 선생님의 권유로 시작하게 되었고, 플루트를 대하는 그녀의 애정과 노력이 더해져 중학교 2학년 때 선화예중으로 편입을 하며 본격적인 전공의 길을 걷게 되었다. 처음 실버 악기를 갖고 한동안 아까워 연습도 못하고 꺼내어 닦기만 했다는 윤수빈. 새소리를 마냥 좋아했던 6살 꼬마아이가 나중 우리나라 유명 오케스트라 플루티스트로서의 첫 걸음을 시작하는 순간이었다.